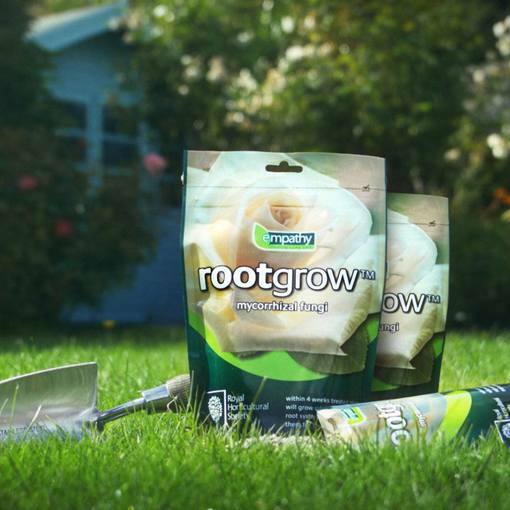 Rootgrow is a pure mycorrhizal fungi suitable for all garden plants and bulbs. Supplied as a 60g pack, or upsize to either a 150g or 360g pack and you will receive a free 10g/10ml scoop. Empathy Rootgrow is 100% peat free and guaranteed to improve drought resistance. It provides an enhanced natural vigour to all plants and bulbs and is environmentally friendly. See Planting and Growing Instructions below for application details. Sprinkle granules evenly into a planting hole prior to planting your plants and bulbs. Apply a large pinch/half teaspoon/2.5g per 2.5cm module plant. Apply half scoop/full teaspoon/5g per 7-9cm pot plant. Apply one full scoop/two full teaspoons per One litre pot plants. Large pots and loose rooted trees require two full scoops/four teaspoons/20g.